Class C – Specialty Contractors of which there are currently 42 different Class C specialty contractors license types. 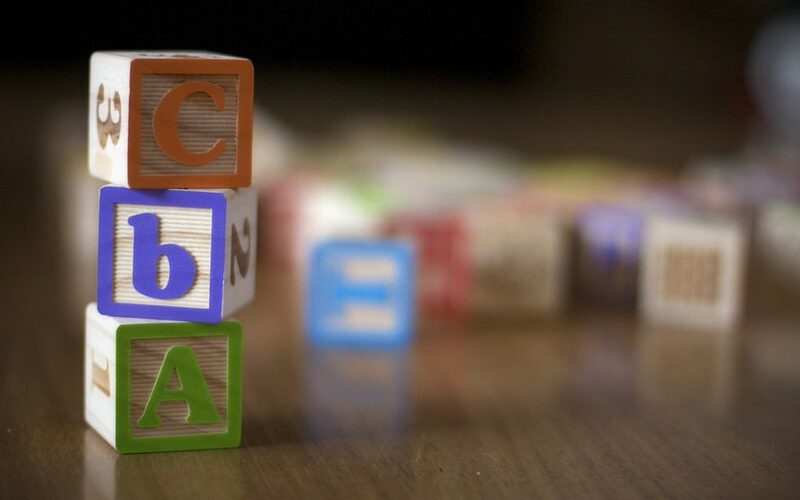 Each of these license classifications has separate contracting rules, and rules regarding when work can be self-performed, which for many can be confusing. One important (albeit “minor”) exception is that no contractor’s license is required no matter what type of work is being performed if the project has a value of less than $500. Known as the “minor work exception,” the exception is a project-based, not work-based, exception. Thus, for example, if a project owner is remodeling their kitchen at a cost of $6,000 and the cost of doing the flooring is only $300, the person doing the flooring would need to have a contractor’s license in the appropriate classification since the aggregate cost of the work is $500 or more. Class A – General Engineering Contractors may only enter into direct contracts and subcontracts for projects requiring specialized engineering knowledge and skills and may only self-perform work that falls within its license classification. 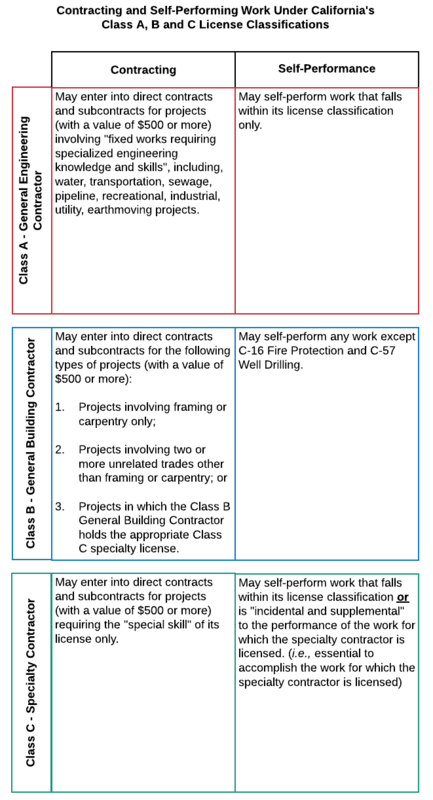 Class C – Specialty Contractors, like a Class A – General Engineering Contractor, may only enter into direct contracts and subcontracts for projects requiring the special skills of its license, but unlike a Class A contractor, a Class C contractor may self-perform work that falls within its license classification or that is incidental and supplemental to the performance of the work for which it is licensed. Thus, for example, a contractor with a C-27 – Landscaping Contractor’s license can do plumbing work without a C-36 – Plumbing Contractor’s license so long as the plumbing work is incidental and supplemental to the landscaping work, such as installation of an outdoor spa. Class B – General Building Contractors, unlike both a Class A – General Engineering Contractor and a Class C – Specialty Contractor, may enter into direct contracts and subcontracts involving: (1) Projects involving framing or carpentry only; (2) Projects involving two or more unrelated trades other than framing or carpentry (i.e., framing or carpentry cannot count toward the two or more unrelated trades); or (3) Projects in which the Class B – General Contractor holds the appropriate Class C specialty license. In addition, unlike both a Class A – General Engineering Contractor and a Class C – Specialty Contractor, a Class B – General Building Contractor may self-perform any work (even work not involving framing or carpentry) except for work for which a C-16 – Fire Protection or C-57 Well Drilling Contractor’s licenses would be required.